"You know, education, if you make the most of it, if you study hard and you do your homework, and you make an effort to be smart, uh, you, you can do well." If you don’t, you may get lost in Vietnam and think you're in Cambodia during Christmas on a super-secret CIA-evil-Republician mission. There is a reason that the terrorists supported Kerry in 2004. But suppose the ''Anyone But Bush'' bumper-sticker set got their way; suppose he and Cheney and Rummy and all the minor supporting warmongers down to yours truly were suddenly vaporized in 20 seconds' time. What then? Nothing, that's what. The jihad's still there. Kim Jong Il's still there. The Iranian nukes are still there. The slyer Islamist subversion from south-east Asia to the Balkans to northern England goes on, day after day after day. And one morning we'll switch on the TV and the smoke and flames will be on this side of the Atlantic, much to President Rodham's surprise. Many of the same people who claim that mental tests are not valid for college admissions decisions, or for employment decisions, nevertheless consider these tests valid for deciding that a murderer cannot be executed when he scores low on such tests — even though he has no incentive to score high. The way the Democratic leadership was in clear collusion with the major media to push this story in the month before the midterm election seems to me to have been a big fat gift to Ann Coulter and the other conservative commentators who say the mainstream media are simply the lapdogs of the Democrats. Every time I turned on the news it was "Foley, Foley, Foley!" -- and in suspiciously similar language and repetitive talking points. followed the case. Not a word about it in the press. When Americans are allowed to vote, a fireman's vote counts as much as George Soros' vote. But if liberals can just get terrorists into the judicial system, a Clinton-appointed judge can rule on a defense funded by George Soros — precisely what happened in [Lynne] Stewart's case. Note that even in liberal New York City, average citizens on the jury voted to convict Stewart, despite her Soros-funded defense. "We've got to have some common sense about a disease [Aids] transmitted by people deliberately engaging in unnatural acts." It is a virtual guarantee that (with the possible exception of left-leaning Republicans of the future) no Republican will ever say the kind of things about Mark Foley that are found here - no matter how much time passes before he is deceased. Republicans, if they are smart, will prefer to forget Foley and treat him as an aberration instead of a beacon, pioneer and example to follow. In my new book . . . . I say that some of us looked at Sept. 11 as the sudden revelation of the tip of a vast iceberg, and I try to address the seven-eighths of that iceberg below the surface -- the globalization of radical Islam, the free-lancing of nuclear technology, the demographic weakness of Western democracies. Other folks, however, see the iceberg upside down. The huge weight of history -- the big geopolitical forces coursing through society -- the vast burden all balancing on the pinhead of the week: in this instance, Mark Foley. Click here to see the ad that the Republicans were afraid to show. P.S. Can someone name one thing in this ad that is not true? Madeline Albright may not have scrubbed bin Laden's walls, but would that have been any worse than retreating from Iraq when it is full of Al Qaeda soldiers? That is what the Democrats will do if they win the fall elections. The ad is really not about Madeline Albright. It is about the Democrats' policies and what they will do if they retake nominal control of Congress. Like so many words infected by political usage, "diversity" seems to imply the opposite of what it ostensibly means. It suggests mandatory, government-supervised homogenization under abstract guidelines rather than a natural and voluntary convergence of different people with common aspirations. We're going to be "diverse" whether we like it or not. This was a honey trap (as they used to say in the Cold War) designed to leverage one peripheral figure's squalid fantasies into political opportunity. It's as predictable as the leaves falling from the trees, except that it only occurs every other autumn. Still, I take my hat off to the media and Democratic Party. Indeed, in the spirit of Bill Clinton, I take my pants off to them. It is a remarkable achievement to have transformed, in little more than a week, the GOP into the Catholic Diocese of Boston with Speaker Hastert as Cardinal Law and the page program as the massed ranks of 7-year-old altar boys. What an awesome force the Dems would be if only the ruthless skill and cunning that went into this operation could be applied to, say, national security. The violence at Columbia University that prevented a Minuteman/Jim Gilchrist speech calls to mind numerous issues, including mob rule, immigration and the nation's pending constitutional crisis. Michelle Malkin summarizes the disgraceful events. Any man who would vote as paid was admitted to the rolls, whether citizen or not; sometimes only a minority of those who cast ballots were entitled to vote. The privilege of addressing the assembly had on several occasions to be won by storming the rostrum and holding it by main force. Legislation came to be determined by the fluctuating superiority of rival gangs; those who voted the wrong way were, now and then, beaten to within an inch of their lives, after which their houses were set on fire. The above quote is from Caesar and Christ, 1944. Within 5 years of the events depicted in that passage, Rome was a dictatorship and centuries of republican, elected government had come to an end forever. The left must silence the Minutemen in order to continue the influx of illegal aliens. The left views the illegal aliens as invading allies in the left's war against America. If the left seizes Congress and the executive branch, it will be through a combination of mob action and electoral fraud, using foreign money and foreign muscle to overwhelm the already beleagured electoral system of this country. We dodged a bullet in the 2004 elections. 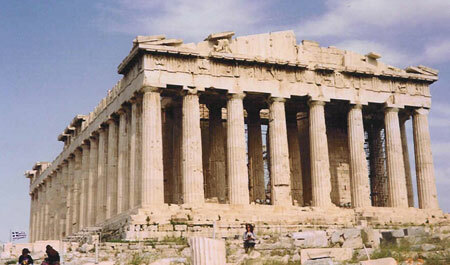 But we have failed to take steps to avert the crisis. We have not prosecuted most of the electoral fraud and violence cases from the 2004 election. The left intends to be more violent and more fraudulent in future elections until their rule is unchallenged. Excellent video using music from the Pet Shop Boys. This may have been intended as a parody, but it is no joke. The video gives us more of the "big picture" in less than 5 minutes than one could get from from a lifetime of reading the New York Times or listening to Matt Lauer's teleprompter. England (and the rest of Europe) is literally disappearing before our eyes. Is the U.S. next? The situation is actually very sad, and the music only makes it more poignant. Well done. Videos have a tendency to be removed from Youtube without warning, so watch it while you can. The end of Europe as we know it. update - Michelle Malkin posts today on Youtube censorship. It is apparent that it will be only a matter of time before the Dhimmis at Youtube remove the above video. Watch it while you can and find a way to download it if you have the technology. I am so old that I was on Jeopardy before Alex Trebek was on Jeopardy and on Meet the Press before Tim Russert. If termites could talk, I always say, they’d call what they’re doing to the house “progress,” and when the house finally collapsed on them they’d ask how the heck that happened. I defy anyone to make a dent in liberal complacency. 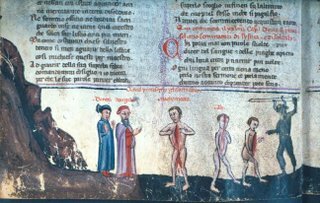 Mohammed is pictured in the middle showing his entrails to Dante and Virgil in one of the earliest depictions from Dante's Inferno. Find more details at Zombietime. 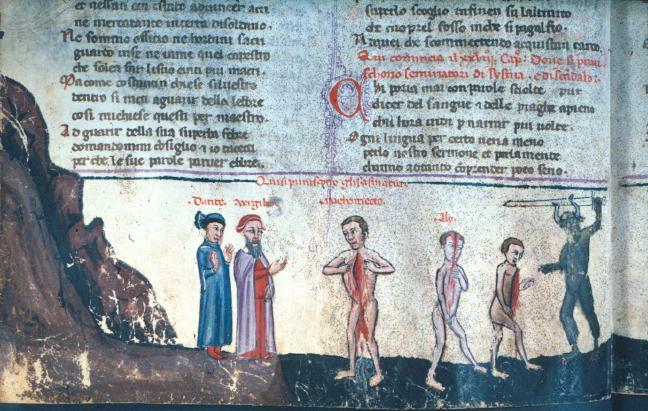 Dante places Mohammed among the "Sowers of Discord" who must endure mutilation for all eternity. The "Sower of Discord" description is fitting considering the state of the modern world. This is the only war in American history in which enemy detainees have been freed before the end of hostilities. Of those released, at least 22 are known to have returned to the battlefield in Afghanistan, Pakistan and elsewhere. I think what drives a lot of the haters crazy is that despite their ceaseless sniping, they can't shut me up. So, I'll be back here the next day and the next cheerfully doing what I do. And the haters will be back in their pigpens doing what they do.